Are you a writer who is always looking for sites that hire writers? Do you enjoy copywriting and are considered well-versed in it? Would you consider yourself a prolific blogger for a targeted niche? 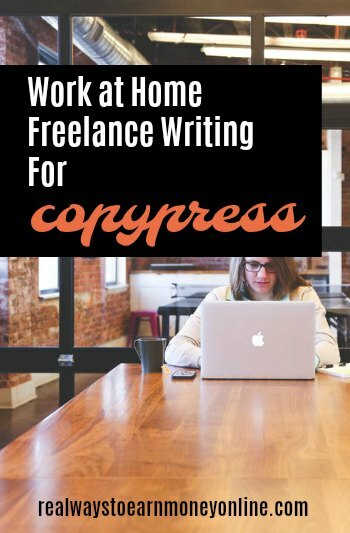 Then the freelance writing site CopyPress might be something of interest to you. CopyPress is currently open to writers in the US, Canada, Australia, and England. CopyPress is a freelance site that uses writers to write for large scale projects in a variety of industries. CopyPress hires two kinds of writers: CopyPress General Writers and Specialty Writers/Bloggers. Founded in 2009, CopyPress is a way to bring creatives (writers, illustrators, developers) and advertisers/clients together. General Writers are eligible for assignments by becoming certified to write specific types of content (sharebait, product copy, infographics). These General Writers will receive assignments in a variety of niches. Once accepted as a General Writer, CopyPress will supply the CopyPress Writer’s Guide and offer certification in either sharebait, product copy or infographics. Specialty Writers/Bloggers are eligible to only write for their specialty. After they have registered, they must prove that they are an expert in their field by also filling out a Specialty Writer/Blogger application form and presenting samples of their work. They will also be supplied with the CopyPress Writer’s Guide. There are also certifications in blogging, becoming an editor, travel writing, product copy, illustrator, and interactive developer. research skills to find interesting stories. knowledge of grammar and writing mechanics. understanding of how blog content works. ability to follow directions from editorial objectives. What is the Pay and When is Payday at CopyPress? Paydays are the 1st and 15th of each month and payment is made via either direct deposit or PayPal. Pay will vary depending upon the client and the assignment. After the freelancer writer/developer registers, the freelancer will need to create a profile. After creating a profile, the writer will select between the two types of writing. Based on that, the HR Department will send the writer the necessary forms to fill out and send back in 10 days. Once assignments come in, the editors and project managers will try to match the writer to the project. An offer email will be sent to the writer, and the writer can accept an interview or decline the project. While there is a job board, only registered writers can apply for these jobs. There is no bidding for jobs. What Are the Computer and Equipment Requirements at CopyPress? Are You an Independent Contractor or an Employee at CopyPress? What Do People Think Of CopyPress? I think that CopyPress really looks like a great opportunity for freelance writers as well as developers and illustrators. The thing that impressed me the most is the ongoing education for writers with the CopyPress blog and certifications. Regarding what other people think, there are some reviews posted on Glassdoor and Indeed. Note that most of these appear to be from in-house employees, but you'll find a handful from their work at home freelancers. Feedback is a little mixed. Some of their writers complained that the pay is too low and the work is sparse while others seemed to think they were paid decently. How Can an Interested Applicant Apply to CopyPress? Go here and begin the process. Good luck to all who apply. Want To Take Things a Step Further And Go Into Business as a Freelance Writer? Here's Some Free Help! There is potential to earn MUCH more money this way. You can get your own clients and set your own rates, which you cannot really do with the CopyPress or sites like it. A six-figure income is not outside the realm of possibility when you're running your own business. Not sure what you'd write about? You might consider grabbing a copy of Gina Horkey's FREE list of 200+ writing niches to consider! Copypress has changed a lot over the years. I used to do a great deal of writing for them until 2012 when everything changed. Despite being certified for several types of articles for Copypress, I no longer get any work from them. They suddenly stopped contacting me and stopped offering work. It stings a little because I used to be one of the people they could turn to in a moment’s notice to get critical work done and I never received a complaint about my work. They just suddenly stopped contacting me and now they do not return my emails. I wish I could point to a particular incident that caused this, but there isn’t one. So, I would warn people to be very careful with dealing with Copypress. The communication is horrible and they seem to be very elusive to writers. The first step is to join the CopyPress Community. It has the look and fel of a social network for writers, editors, designers, and other creatives. Set up your profile there much like you would in LinkedIn or another social networking site. Your login name and password gives you access to their training materials. Next, use the training materials to obtain your first certification. Most of them require you to pass a multiple-choice quiz based on the training documents. Passing that makes you eligible to complete a test assignment. Get a passing grade on that assignment to earn your certificate. Now you can complete the HR materials as the post said. As a general writer, you can expand your assignment eligibility by earning more certificates without completing new HR forms. Should you wish to be an editor as well, you’ll have to earn the editing certificate and complete a second set of HR forms to be eligible for work. I don’t know anything firsthand about becoming an expert or specialist. That requires additional credentials such as an established Google+ following. That’s the hiring process as I understand it. Good luck to all who try. I’ve gotten many interesting and challenging assignments on topics such as travel, technology, sports, politics, health, personal finance, and cars. @Phil – Thanks for sharing. I just didn’t go into the awesome amount of detail that you did. Thanks. Nothing like a live WAHer that shares “hands-on”. Seems to be working out well for you too!